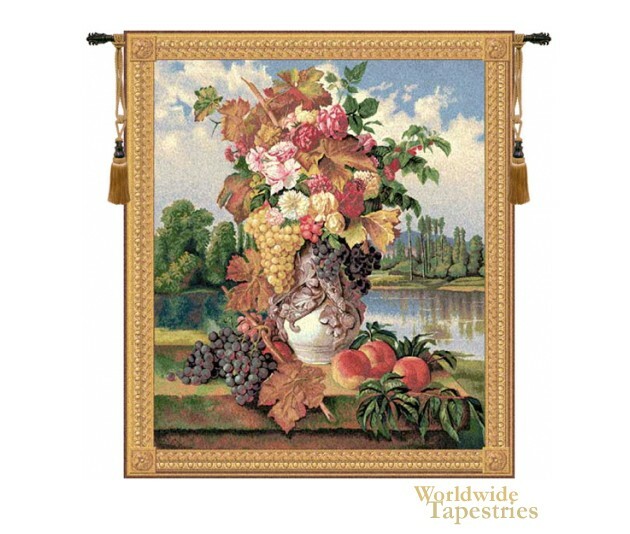 Reflections tapestry shows a white vase filled with flowers in full bloom and fruit in full ripeness. Here we see a scene that is inspired by 17th century floral works of the Belgian and Dutch masters where fruit was a subject by which artists would show both their skill of artistic rendition and the beauty of nature. The background is a natural landscape of a lake and trees. Grapes and peaches are also seen on the stone ledge. The Reflections tapestry is backed with a lining and a tunnel for easy hanging. Note: tapestry rods and tassels, where pictured, are not included in the price. Dimensions: W 38" x H 44"
Dimensions: W 55" x H 63"